Discussion in 'Model S: Interior & Exterior' started by pr0teu5, Apr 1, 2016. So we all know that a pretty big update to the Model S is coming in early April. We have also seen Tesla experimenting with very large glass panels. In the X there is the large wrap around front panel, and we see the large panoramic rear windshield in the 3. I would bet that in the S update we see both features. I don't know if such a thing could be accomplished due to safety reasons, but it would definitely be very cool. How do we know a "pretty big update". Is coming in early April? I've seen the rumors but nothing concrete. Have I missed something? Well considering the leak of the P100D and the official confirmation that their will be "price changes" to the Model S in April I think a refresh of some kind is quite likely. However, as to the original point about the Model S gaining the X's front panoramic windscreen as well as the 3's rear panoramic windscreen, I was mistaken. It will almost certainly not have the 3's rear panoramic windscreen. To do so would mean that it would be difficult - or impossible - to have the current Model S hatchback and jump seats. I didn't think about that. If you look at the Model 3 it has a traditional trunk and not a hatch. The article about price changes for the Model S in early April can be read here. Edit: Anyway, you two are right we don't "know" there is an "significant update" coming. I should've said that it seem likely that their is an update coming in early April that may extend to exterior styling, dimensions, etc. Do you all really think there will be a design change in the model S produced after April 2016 ? There's definitely some fairly significant chance that it'll happen. The P100D and Tesla will surely update the S to match the same exterior styling as the X and 3 at some point. I say September at the earliest. Doesn't make sense to refresh in April. Why do you think it doesn't make sense? I thought since they've said they're doing price adjustments in April that it made sense to do it then. Electrek also reported that there will be design changes in addition to price changes. By the way, this was rumored to be the Model 3 or the Model S facelift. After the reveal I have the feeling this is the ModelS facelift, so it looks like it will get the X front. That is actually the Model 3. You can tell by the headlights under the veil. They have the shape of the Model 3 headlights. No that is an S. The dimensions don't match the 3. Someone on Reddit overlaid an S 3D model over the draped image and it matches precisely. I don't think that is correct. 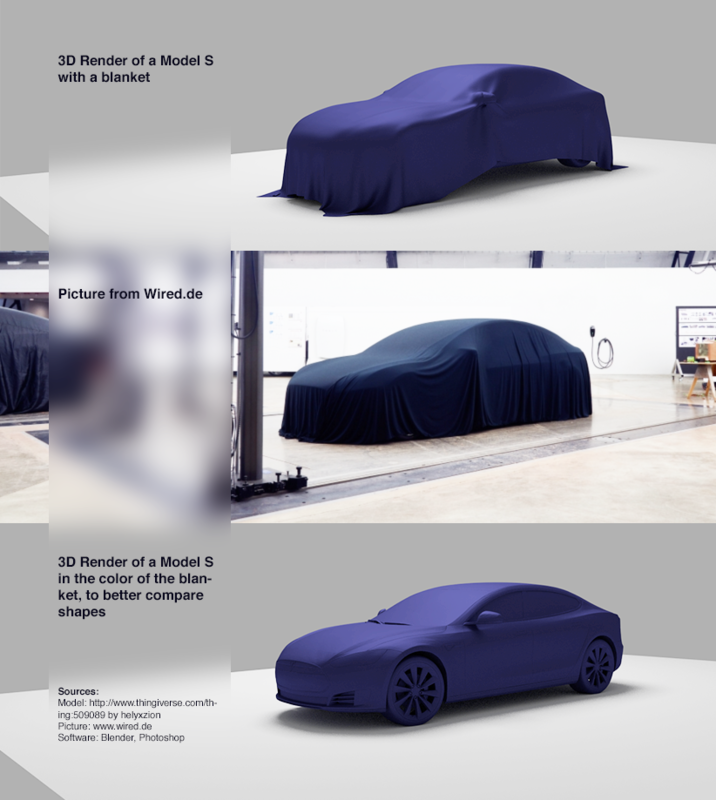 The draped image that was matched was the image in the original Model 3 invite. The in question came from a wired article and was not matched to a Model S.
So the Model S on the left, and the shadowed vehicle on the right were match, but the veiled car in the wired article was a Model 3. So the question is if no refresh in April, will the "refresh any minute" folks who have been pounding the table for a year finally stop? I've been guilty of pounding the refresh any minute drum since October (not a year). If a refresh or new features aren't announced by end of April I will stop.